Glafira Rosales in court Tuesday, September 17. On Tuesday, September 16, 2013, Glafira Rosales plead guilty to charges of conspiracy, wire fraud and money laundering. 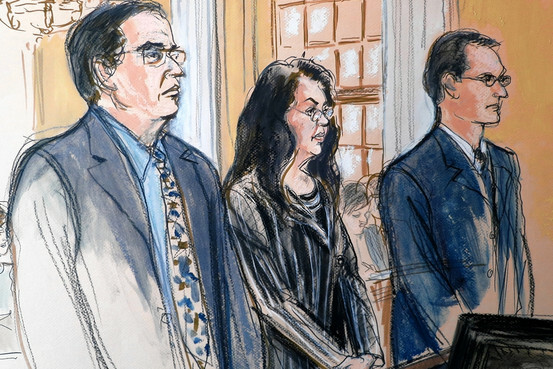 Rosales admitted that she sold more than 60 forged paintings to galleries, including fake works by Willem de Kooning, Robert Motherwell, Barnett Newman, Sam Francis and Franz Kline. One of those galleries was the Knoedler Gallery, which along Julian Weissman Fine Art in Manhattan sold the works for $80 million. “From in or about the early 1990’s through in or about 2009, GLAFIRA ROSALES, a/k/a “Glafira Gonzalez,” a/k/a “Glafira Rosales Rojas,” the defendant, and CC-1, together with other known and unknown, conspired to sell dozens of fake works of art. The fake works or art were created by the Painter in Queens, New York, at the specific request of CC-1. ROSALES and CC-1 also conspired to launder the proceeds of the scheme by transferring the proceeds through foreign bank accounts. ROSALES, who was a U.S. taxpayer, also hid the income generated by her participation in the conspiracy by filing false tax returns and failing to report the existence of the foreign bank account that she controlled, as required by law.” (CC-1 is an unnamed co-conspirator, suspected to be her boyfriend). The penalties for Rosales charges are high: she could face upto 99 years in prison and be deported from the United States to Mexico, of which she is a citizen. But, she is said to be cooperating with authorities in the hope for a lenient sentence. Rosales has promised to pay $81 million to the scheme victims, forfeit cash, remaining artwork and even her home. For our original coverage of the Knoedler Gallery closing and cases dealing with Rosales fakes see: And Another: Fake Rothko from Knoedler; Lagrange v. Knoedler — Settled. Sources: “Art Dealer Rosales Pleads Guilty to Fake Paintings Sale,” Bloomberg, September 16, 2013; “Art Dealer Pleads Guilty Over Fake Works,” The Wall Street Journal, September 16, 2013.